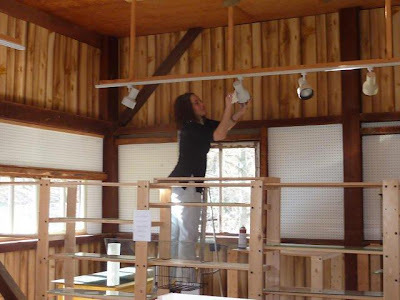 It was the time of year to clean the barn and install art work at the Lost River Artisans Cooperative in Lost River West Virginia. As usual it was a wonderful collaboration of cleaning fiends or should that be friends, because it sure seems like this is a great group of peeps who come out to lift a dust rag and eat good food together to get ready for the public! 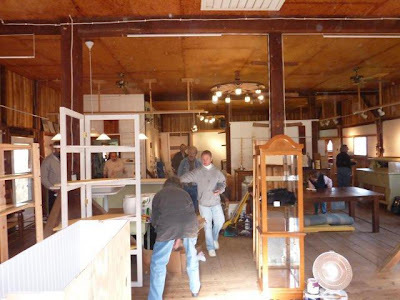 Tim Wheeler (current LRAC President) is directing his artistic cleaning crew to paint, dust and sweep this large space. About 30 people showed up to lend a hand. A little window washing (also known as an outside comedy act!). Much more goofing off from the heights of the ladder would have resulted in a few broken bones! Yours truly on another ladder for a calmer job of dusting lights. Trust me, Tim was running out of jobs to give people. "What do you want me to do now, Tim?!" After clean up, a little installation of some of my work. After a nice warm day with this lovely group, I took off in my old car for a nice 20 m.p.h. ride home. Okayyyy, I was BEHIND this slow poke, but what a cute slow poke it was, until I passed him. This is always a nice country ride to and from Lost River and well worth the drive. So is the art - take a stroll and wheel on down sometime. Check out their site and see the demos, classes and festive activities ramping up for the year. If you are an artist interested in selling your wares, they will still jury new artists in for 2010. There is even a cool shop next door for a yummy bite to eat. Arts at Canal Place is featuring a collective art show titled "What's New". Included in the exhibition are necklaces and earrings by Mary "Macee" McCunn, made of copper, brass and steel. 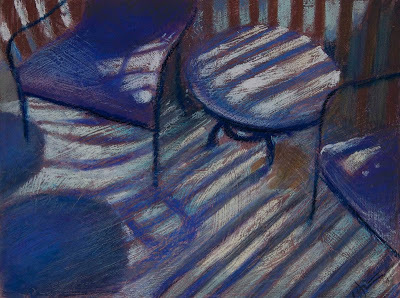 Pat Hilton is included in the show with her lovely pastel titled "Snow Shadows". Other artists showing photography, monotype prints, felting, watercolor, enameling, 2d paper, steel forged items and sculpture are also part of this show that is open to the public from March 7 - April 10. Stop by the gallery anytime between 10-6 daily to check out the show. For more information visit www.artsatcanalplace.com.